Manchester City dropped to third place after suffering a 1-2 defeat to Leicester City in the English Premier League. Manchester City dropped to third place after suffering a 1-2 defeat to Leicester City in the English Premier League. Pep Guardiola’s men on Wednesday took an early lead through a Bernardo Silva goal at Leicester’s King Power Stadium but the 2015 English champions fought back with goals from Marc Albrighton and Ricardo Pereira. The champions also ended with just ten men following Fabian Delph’s straight red card in the 89th minute. 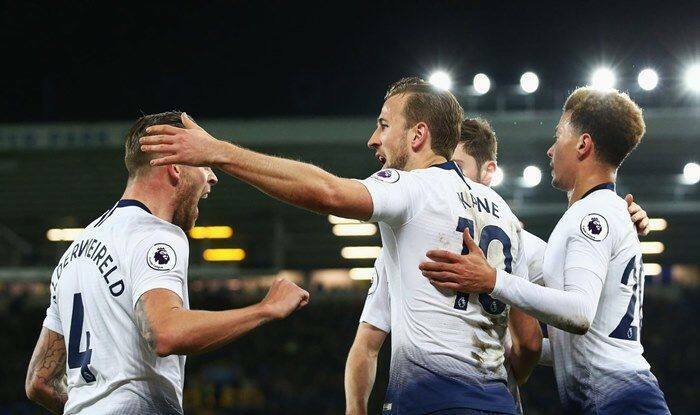 While, Tottenham Hotspur produced another scintillating performance, defeating Bournemouth 5-0 to surpass Manchester City to the second place in the Premier League. City have lost four of their last three league matches and have now slipped seven points behind leaders Liverpool and one point behind Tottenham Hotspur. Liverpool stormed past Newcastle United 4-0 at Anfield and Tottenham demolished Bournemouth 5-0. City dominated the game and in the 14th minute, Sergio Aguero spotted Silva’s clever run and fed the ball to the Portuguese who calmly flicked it past Kapser Schmeichel. The lead lasted just five minutes as Albrighton received a pass from Jamie Vardy inside the box and made no mistake from close range to level the scores. City continued to control the game in the second half but Leroy Sane’s poor header in the 81st minute was punished with a spectacular finish from Ricardo. Guardiola said afterwards: “We have to accept it, we have to realize that we have to work harder and try to get immediately one good result and get our confidence back. “We are together, we will work harder and we will come back with some good results. The season is very long and we have lots to fight for. Manchester City will play Southampton on December 30, before a home game against league leaders Liverpool on January 3.